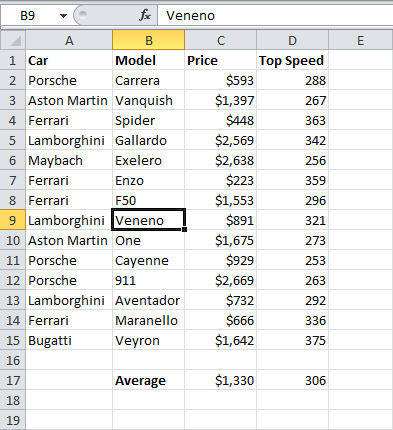 Use data validation in Excel to make sure that users must enter certain values into a cell. In this example, we restrict users to enter a whole number between 0 and 10. To create the data validation rule, execute the following steps. 3. In the Allow list, click Whole number. 4. In the Data list, click between. 5. Enter the Minimum and Maximum values. 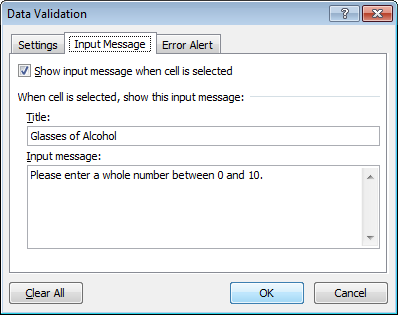 Input messages appear when the user selects the cell and tell the user what to enter. 1. Check 'Show input message when cell is selected'. 3. Enter an input message. 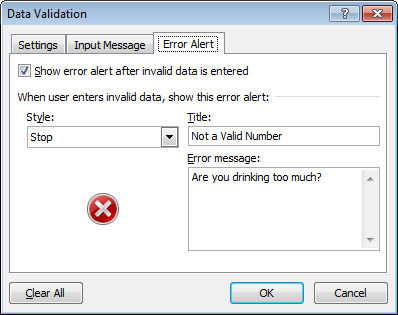 If users ignore the input message and enter a number that is not valid, you can show them an error alert. 1. Check 'Show error alert after invalid data is entered'. 3. Enter an error message. 2. Try to enter a number higher than 10. 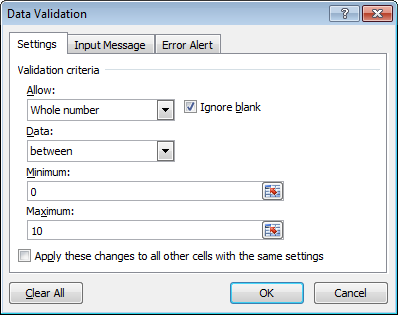 Note: to remove data validation from a cell, select the cell, on the Data tab, click Data Validation, and then click Clear All. You can use below example of Excel's Go To Special feature to quickly select all cells with data validation. 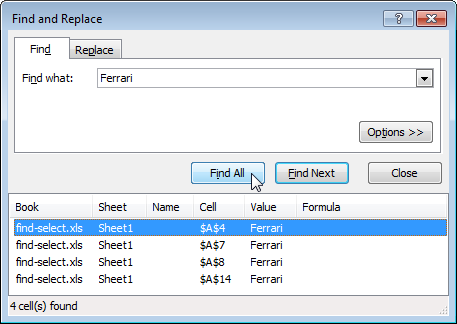 You can use Excel's Find and Replace feature to quickly find specific text and replace it with other text. 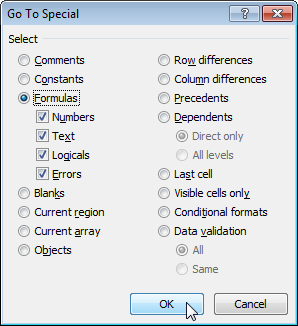 You can use Excel's Go To Special feature to quickly select all cells with formulas, comments, conditional formatting, constants, data validation, etc. To quickly find specific text, execute the following steps. 1. On the Home tab, click Find & Select, Find. The 'Find and Replace' dialog box appears. 2. Type the text you want to find. For example, type Ferrari. 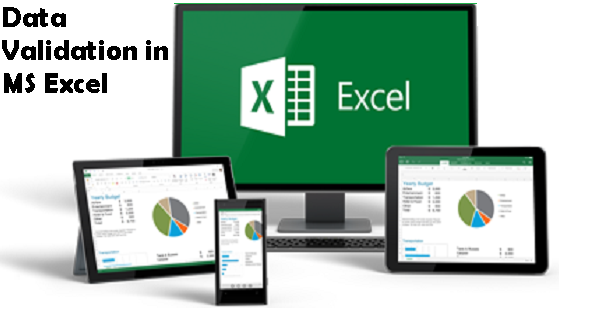 Excel selects the first occurrence. 4. Click 'Find Next' to select the second occurrence. 5. To get a list of all the occurrences, click 'Find All'. 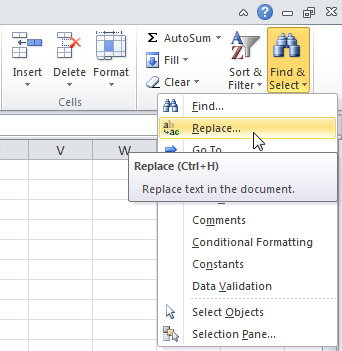 To quickly find specific text and replace it with other text, execute the following steps. 1. On the Home tab, click Find & Select, Replace. The 'Find and Replace' dialog box appears (with the Replace tab selected). 2. Type the text you want to find (Veneno) and replace it with (Diablo). Excel selects the first occurrence. No replacement has been made yet. 4. Click 'Replace' to make a single replacement. Note: use 'Replace All' to replace all occurrences. 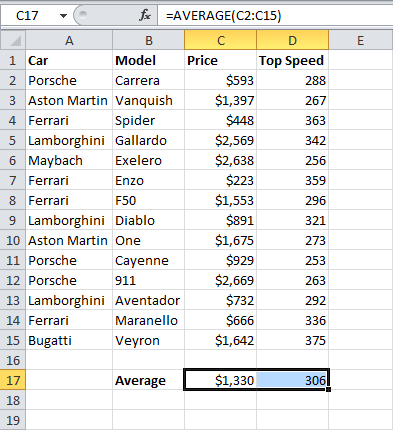 Note: Formulas, Comments, Conditional formatting, Constants and Data Validation are shortcuts. They can also be found under Go To Special. 3. 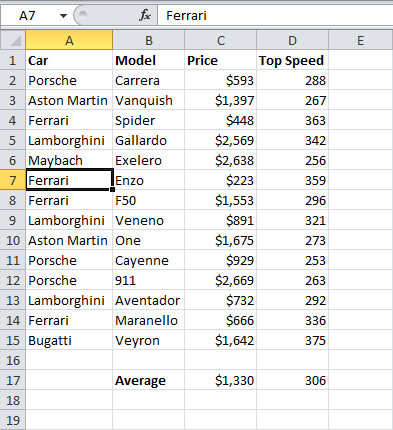 Select Formulas and click OK. Note: you can search for cells with formulas that return Numbers, Text, Logicals (TRUE and FALSE) and Errors. These check boxes are also available if you select Constants. 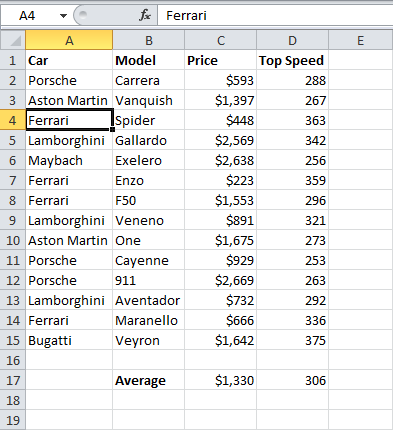 Excel selects all cells with formulas. 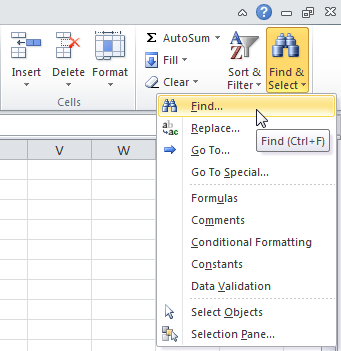 General note: if you select a single cell before you click Find, Replace or Go To Special, Excel searches the entire worksheet. To search a range of cells, first select a range of cells.